The only time we get to read for pleasure is a long-haul plane flight or a summer weekend when the world is just a little bit slower. Oh, and those 8 minutes before we fall asleep at night, exhausted but determined to read a page or two to keep our heads alive. Below we offer the reader a range of rapid reads, all meant to entertain at a really low cost – say $2.99 – or less than the price of an iced latte. Lasts longer too. All she wanted was some donuts…a sugar rush to drown out her loveless suburban life and cheating bald husband. What she got was her true self back, with the help of two really young, really hot gang bangers. You’ll be done reading in 2 hours and you won’t know what hit you. But you’ll be smiling, that we can promise. “This is the most insane fun I’ve ever had reading a book in my life. If you like a Quentin Tarantino movie crossed with aliens and drug cartels, this is your book. It’s so much fun, you just might snort out loud, alarming your seat mates. White Deer of Autumn, author Gabriel Horn, has created an beautiful portrait of a young girl coming to grips with her heritage, her community, and a world where her highest ideals – those of the natural world – are being destroyed by seemingly unstoppable evil – the British Petroleum oil spill. This beautiful young adult novel won the 2016 International Book Award winner, 2016 Indie Excellence Book Award winner, 2016 Paris Book Festival Award winner, the 2016 Award for Literary Excellence from the Friends of the Florida Library and a winner of the 2015 Florida Book Award. As a publisher spit out of the initial seizure of publishing-shrinkage, I bobbed around like a Styrofoam cup on the waves for awhile. I was angry at industry leadership for fixing prices, lying, lawyers getting all the money. Not writers. Not copyeditors. Not designers. Not agents. Not editors. LAWYERS. What did all this money do? Built an empty library, a room with no books, paper or otherwise. I doubt there were even desks. Then I removed myself from the industry spin and really started thinking about what e-books meant. Sure, publishing CEOs Carolyn Reidy and John Sargent were testifying in front of Federal Judge Denise Cote with their fingers-crossed behind their backs about price-fixing but, on the other side of the globe (in all respects), the march toward an e-book world continued. Publishing was entrenched in a range war that did not change the fact human beings were afire with information. It was spreading fast and free. These e-readers, for the first time in history, allowed you to carry the equivalent of the Library of Alexandria in your hand. (Well, almost.) These e-readers can be taken where books cannot; down a river to a school, up the side of a mountain to a settlement, into a rural health clinic where mothers are giving birth. All these e-readers need is to be loaded full of books – on mathematics, science, African novelists, politics, history AIDS, Ebola, conservation, history, medicine, farming, language, animal husbandry, accounting, business – and carried in, by visitors, so they make their destination. The generator charges the e-reader. Believe me, it is achievable now: We still have 30 boxes of kids’ books lost somewhere over the Congo. Our first school for E-book Africa? Chiawa Basic. It sits atop a slope down into the Zambezi River: Children are lost to crocodiles each year when they go to get water. The former camp of the great “Dr. Livingston I presume” is around the river’s bend and his great Cathedral, built over the slave-fattening pit, is a little upriver. The town is tiny, beyond poor, riddled with AIDS, and beautiful beyond words. Enter Cherri Briggs and Richard Wilson, owners of Explore Africa and two of the greatest micro-lenders in Southern Africa. They fought off Chinese mining companies and more than a few death threats while keeping their stretch of the Zambezi intact. They provided burials for the kids taken by crocs and eventually got water running up to the school. 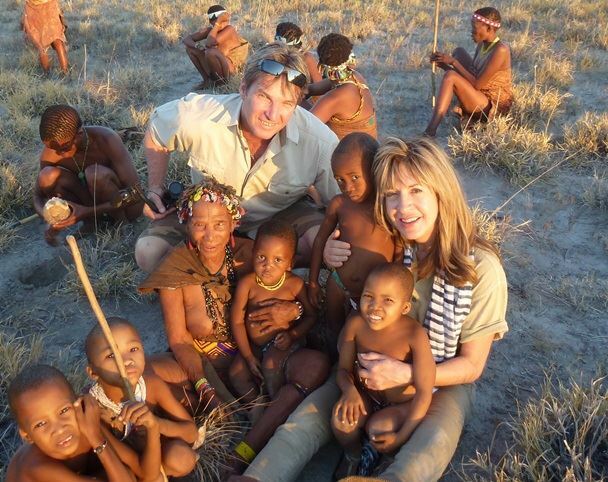 Cherri and I started “Chicks for Chicks,” after a foolhardy bounce through Zimbabwe. These vertical chicken farms (watch your predators!) were given to women to create small family businesses. A huge fish farm was dug in the African bush. The restaurants in the capitol of Lusaka are now full of their foods, bought for a fair price. Cherri and Richard started cracking the code of Africa graft: Go around the NGO and straight to the Village Chief and Elders. When the Chief saw his first e-reader, there were moments of confusion that it toasted something. Then the words sprang up and he shouted. Cherri and Richard knew he knew he was holding magic in his hands. In seconds, the village pushed in on him and they didn’t stop pushing buttons and flipping pages for hours. E-book Africa was on. Me? I’m still a bit of a Styrofoam cup inside myself, but the work on E-book Africa is helping me fall in love with all of life’s work again. I started a publishing services company, edit a wild range of gifted writers that a publishing company wouldn’t let through the front door, and I write my own books again. Most importantly, when I got away from the anger and hysteria of publishing, I started to read again and feel the edges of that joy starting to return. I can’t wait to get to Chiawa Basic School in Zambia with those first set of e-readers loaded with intellectual loot. I can’t wait to watch those kids watch us put everything together and then pass them their e-reader. On their faces I’ll see it, that thing I lost. The words. The possibility. The future. The magic. Like all givers, I am the one that wins: I need their joy to help bring me back to mine.